According to old maps, before the C&O Canal was built, there was “a “Marble Quarry” running along the Maryland side of the river for over a mile. The stone that was quarried here was known as “Potomac marble,” which wasn’t a solid substance, but rather was composed of angular pebbles held together by a limestone matrix. Benjamin Latrobe discovered Potomac Marble with its varied and rich colors and made the decision to include it in the Capitol buildings he was designing. Because the canal had not yet been built yet, the blocks of stone took an arduous boat trip down the river through the Patowmack Company’s skirting canals at Seneca, Great Falls, and Little Falls. After arriving at its destination, the marble proved incredibly hard for sculptors to work with, as the small peddles crumbled away easily. However, they persevered and today, Potomac Marble from this site can be seen in the columns at the Old Hall of Representatives, and at Statuary Hall. The Marble Quarry Campsite is a hiker/biker campsite. 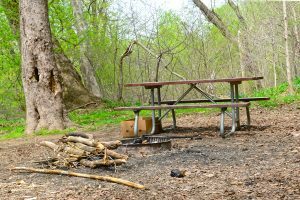 Amenities include a chemical toilet, water, picnic table, and grill.